Sometimes the guard house, or guard shack, if you prefer, is located a long distance from a main building with toilet facilities which is why many purchase guard houses with bathroom included. Providing a guard house with a restroom is routine for us. With over twenty years’ experience in designing guardhouses with toilets we would be delighted to assist you in designing your next guardhouse with a restroom. 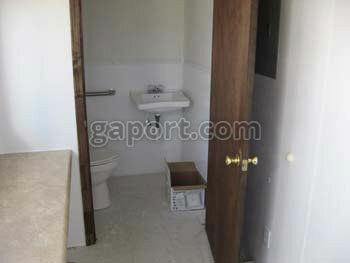 Our most popular guardhouse bathroom includes a commode, sink, small water heater, ceiling light with exhaust fan, GFCI GFI receptacle and light switch. 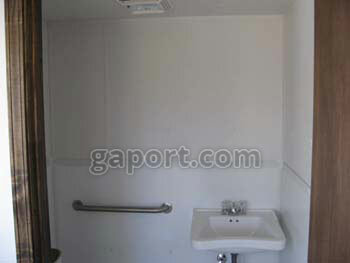 Don’t forget that in nearly all cases, a guardhouse bathroom will need to be ADA Compliant. (Americans Disabilities Act). Therefore the necessary grab bars are also included. 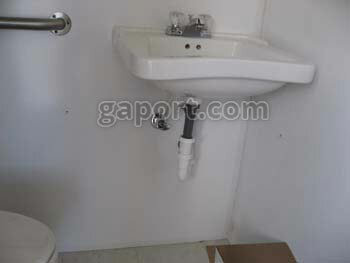 For the required wheelchair turning radius in your guardhouse toilet, you may need more space than you originally planned when you first considered purchase of guard houses with bathroom. DOORS:Our exterior doors can be the standard swinging type or sliding glass. Our hinged (swinging doors) are 3’0” x 6’8”, insulated, metal doors with fixed half glass, nine light windows. They are standard with knob lock and dead bolt, keyed alike. 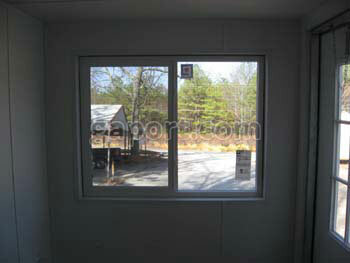 If you need sliding glass, a 6’0” x 6’x8” sliding glass door is available. 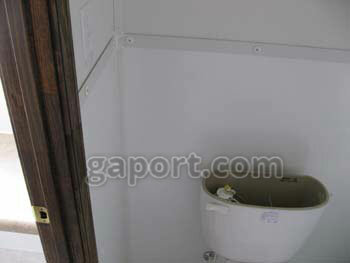 Electrical: Our security booth with toilet comes standard with a 100 Amp panel with main breaker. 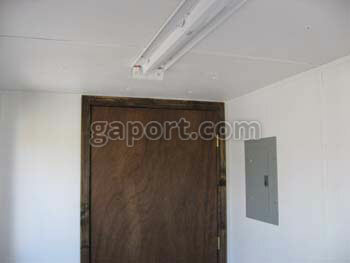 The number of fluorescent lights and duplex receptacles varies depending on the size of your guardhouse. 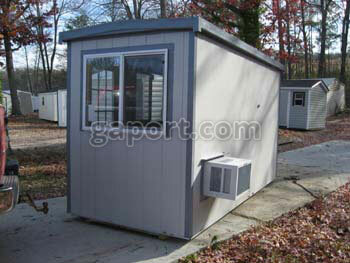 Purchase guard house bathroom facilities for convenience, to fit whatever circumstances you are facing. 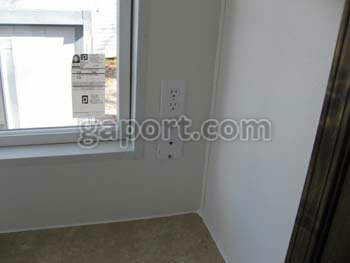 NOTE: Popular electrical options include exterior floodlights and exterior GFCI receptacles. 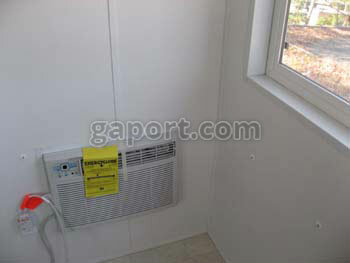 Your guardhouse can be equipped with Wall mounted Air Conditioning units in size from 7,000 BTU up to 220 Volt, 18,000 BTU units. If you prefer both heat and cool, we have units ranging in size from 8,000 BTU to 18,000 BTU. If you are located in a really cold climate, you might want to add a wall mounted, fan forced heater in 1500 watt, 120 volt capacity or 3000 watt, 220 volt heater. Both are thermostatically controlled. Another popular heating option is a 48” baseboard heater. 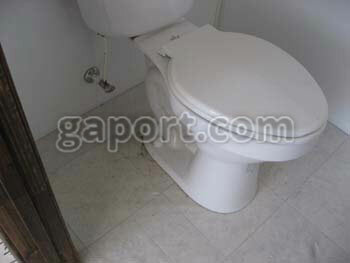 If you are planning to buy a guardhouse with toilet, chances are it will be occupied twenty four hours per day, seven days per week. That means a lot of wear and tear. We build them sturdy to handle that kind of occupancy. Our wall studs are on 16” centers, and the exterior side of the studs is covered with ½” OSB Sheathing to give the walls added strength. Over the OSB we use a flat type aluminum siding in your choice of our standard siding and trim colors. Aluminum won’t rust and the OSB underneath makes it extremely dent resistant. The roof is galvanized steel rolled roofing over 7/16” roof decking. The guardhouses have a 3” eave on four sides to reduce water running down the sides, over the doors and windows. Roof rafters are 2” x 6” cut down rafters to provide water runoff. 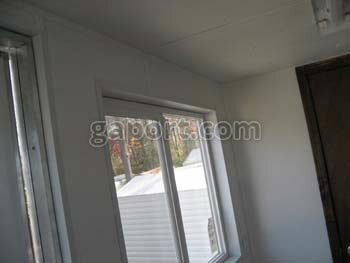 Walls are clad with vinyl clad gypsum. That makes a durable, easy to clean finish. The ceilings are also gypsum with a sea spray texture. Walls and ceiling are insulated with fiberglass insulation rated R-11. 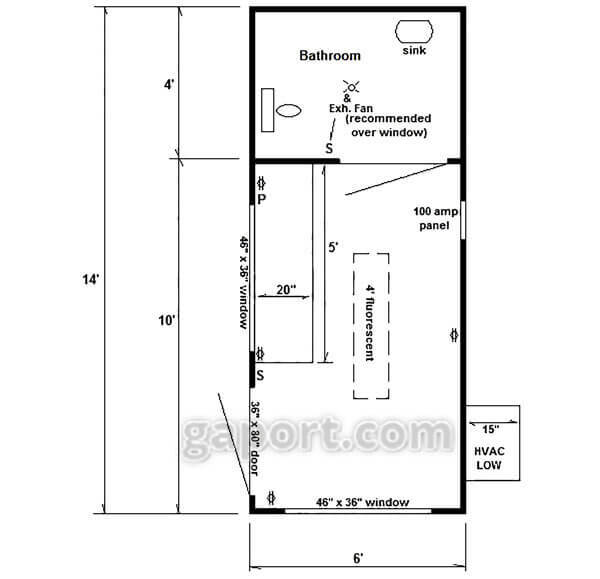 Standard interior height is 84”, bigger security guard buildings can be ordered with 90” wall height if you prefer. 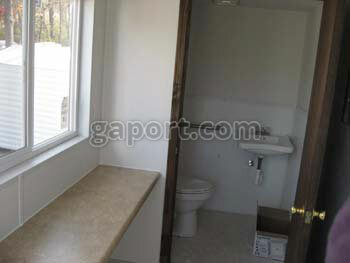 Our guardhouses with restrooms are equipped with insulated, meaning double pane glass windows standard. They are horizontally opening (slide side to side) and have a white frame. Our intent is to provide enough windows for maximum visibility. A premium osb floor over pressure treated floor joists is standard. The floor is insulated and covered with interior durable vinyl flooring. Under the joists are pressure treated, permanently mounted skids for easy transport. C-Channel forklift pockets are standard on smaller guard houses and available as on option on other sizes. 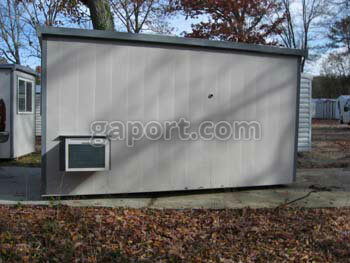 If your guardhouse requires a diamond plate floor with steel floor joists, we can accommodate your needs. 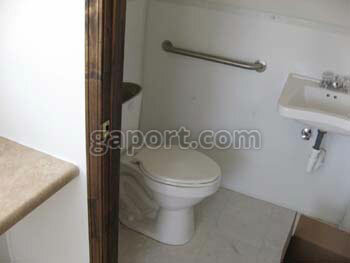 Your guardhouse with toilet can be equipped with one or more 12” deep wood shelves in the guardhouse restroom if you request. 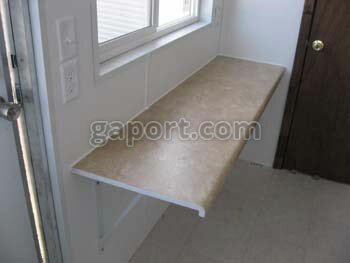 In addition, we offer 20” deep laminated counter space. We run the counter across the narrow end of your guard shack. The counter is standard on smaller sized guardhouses. 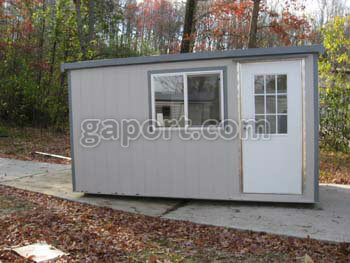 In some large prefabricated guard houses, customers prefer to use their own desks rather than counter space. If you need custom designed layouts with counters on 2 or 3 sides, this is an option that we will gladly provide. 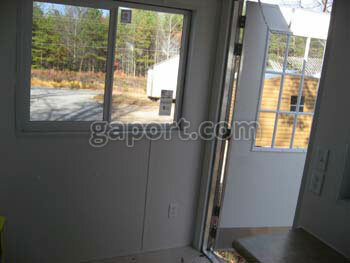 Purchase guard houses bathroom included and we can deliver in the North Georgia area with our own trucks. We also have shippers who regularly handle our guardhouses and we would be glad to arrange shipping with one of these carriers. 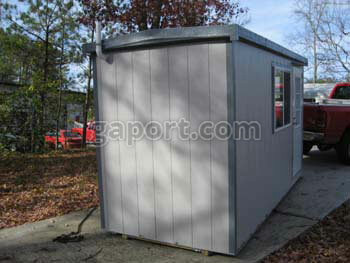 If you prefer to send you own truck, we can load your guardhouse for you. We will be glad to quote the shipping cost to your destination. We regularly ship to the following states: Alabama, AL, Arkansas, AR, Delaware, DE, Georgia, GA, Illinois, IL, Iowa, IA, Kansas, KS, Kentucky, KY, Louisiana, LA, Maine, ME, Maryland, MD, Massachusetts, MA, Michigan, MI, Mississippi, MS, Missouri, MO, Nebraska, NE, New Hampshire, NH, New York, NY, New Jersey, NJ, North Carolina, NC, Ohio, OH, Oklahoma, OK, Pennsylvania, PA, Rhode Island, RI, South Carolina, SC, Tennessee, TN, Texas, TX, Vermont, VT, Virginia, VA, West Virginia, WV, Wisconsin, WI. 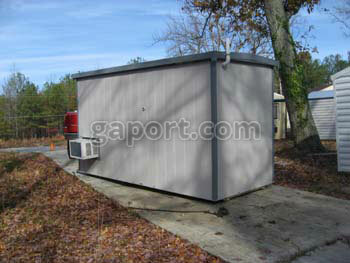 Need A Guard House With A Restroom? * Sample layout, may include more features than standard.